This is the Best Eggnog Recipe you will ever find! 8 ingredients – 15 minutes. Ultra creamy. Watch out to save some eggnog for your family. To make eggnog is not rocket science. Actually, it’s pretty easy. Here is the deal: I show you how to make the best eggnog recipe in the world. I developed this recipe over the years and now it is just perfect. The flavor is amazing, and the consistency is dreamy creamy. Two vanilla beans, 1/2 teaspoon cinnamon, and 1/4 teaspoon nutmeg are responsible for a very intense flavor. It’s like Christmas in a cup. This eggnog screams for holidays. Picture yourself in your jammies, sitting in front of your chimney. You see lots of Christmas decoration and a beautiful blinking Christmas tree. You listen to Christmas music and are totally in a good mood. Holding a cup of eggnog in one hand and putting one cookie after another into your mouth with the other hand. How long is it until Christmas again? The eggnog is sweet, boozy, and super creamy. But be careful. It’s super addictive. Don’t say I didn’t warn you. This is recipe No.3 of our Christmas journey. Are you already in Christmas mood? If not maybe you missed recipe No. 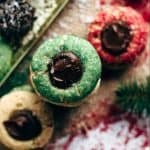 1 Christmas Thumbprint Cookies and recipe No.2 Easy Chocolate Rum Truffles. Okay, back to our holiday daydream…. a big heap of sweet whipped cream on top is a must. It makes your eggnog experience even creamier. Not that the eggnog itself is not creamy. Just wanted to say. Sprinkle nutmeg and cinnamon on top and slurp your eggnog. Do you want to know what fits perfectly to eggnog? Gingerbread men! I dipped them in the eggnog, like a cookie into milk. …..Gingerbread men…..recipe no.4. Psst. In two days….. If you make this Best Eggnog Recipe leave a comment, rate it and tag a photo #alsothecrumbsplease on Instagram! Would love to see your snap! 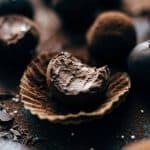 Until recipe No.4 gets published eat some Christmas Thumbprint Cookies or Easy Chocolate Rum Truffles with your eggnog. With a handheld or stand mixer fitted with a whisk attachment whisk egg yolks and sugar until creamy and fluffy for about 2-3 minutes. Set aside. Heat milk and cinnamon in a heavy saucepan over medium-high heat until it reaches a boil. Stir continuously. Remove pan from heat and turn heat down on low-medium. Add about a 1/4 cup of hot milk to the egg yolks and stir until combined. Pour tempered egg yolks into the saucepan and place back on heat. Cook for about 5 minutes over low-medium heat until the eggnog gets thicker. Stir consistently. Do not boil. Remove from heat and stir in vanilla and nutmeg. Let cool to room temperature. Stir occasionally. Mix heavy cream until soft peaks form. Add cream and rum to cooled eggnog and stir with a whisk to combine. Chill in the fridge for at least 2-3 hours. I chill mine overnight. Store leftovers in the fridge up to 1 week. Yesss, I will totally try this one for Christmas this year! Looks delicious! Thank you so much! Merry Christmas and enjoy it! I hope you do. It’s super delicious, creamy, and easy. Best drink for the holidays. Merry Christmas, Nana! Hi, This looks amazing. Can we please get the video as well?